£830 inc vat and 2/3 day delivery. The robust handle and semi-pneumatic tyres ensures transport and maneuverability are not compromised. It’s lightweight yet robust design is ideal for commercial and residential work. Its compact size permits one-man operation, yet it has the capacity to handle several room-size areas at a time. Best of all, it’s affordably priced within the budget of most restoration specialists. The RM85 housing also incorporates a facility to safely stack units, thereby significantly reducing storage and transportation costs. 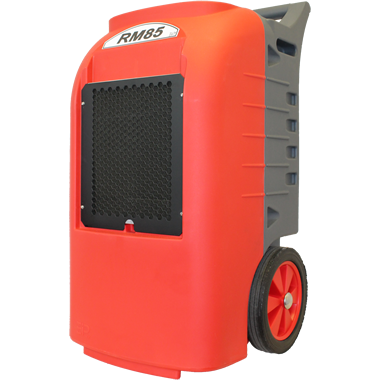 The RM85 is equipped with a “Reverse Cycle” defrost system, ensuring a quick and efficient clearing of ice from the coil, allowing a minimum operating temperature of 5°C. ATTENTION TO DETAIL Sometimes the less expensive features are overlooked. 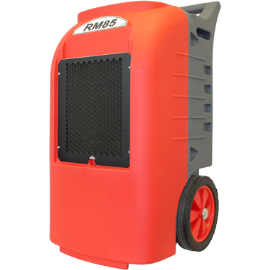 The RM85 is supplied complete with cable and hose tidies, Not only will this reduce the possibility of damage when the units are transported, but also provides easy installation when positioning the equipment.